Creating what you want is easier when you know how to roll the D.I.C.E. The moon is constantly changing, reflecting our emotions, needs and moods. We enhance our ability to manifest and understand ourselves better by learning to work with nature’s rhythms. The lunar cycles are one way to do it. The moon and earth have a gravitational pull between them. The ocean tides are created as a result of this pull. Because our body is primarily made up of water, we too are pulled by the ocean tides and lunar cycles. The moon travels through each of the astrological signs over a year. We can enhance our ability to create what we want when we learn about the characteristics of the astrological sign it is moving through. The more attune we are into our inner world and natural flow the more likely we are in reaching our goals. Learning about the phases of the moon and the astrological signs they move through are tools to assist us in understanding the ebb and flow of life. Astrologers break the lunar cycles into eight cycles and how to work with each one. The moon represents the emotional side of ourselves; the dark or hidden aspects. When there is a New Moon, the sun and moon are in the same astrological sign. Typically our emotions are in a calmer state. We have more clarity and feel less influenced by our emotions. This is the perfect time to set new intentions and begin new projects. When the moon is full, the sun is in astrological house and the moon is in the opposite one. For example, when the sun is in Aries the full moon is in Libra. Aries represents the self and Libra represents others. We learn about emotional wounds and patterns that need to be resolved with the full moon because we are seeking balance between opposing forces; in this case the needs of me (Aries) and the needs of others (Libra). Each month we hold free conference calls to help you learn more about the characteristics of the astrological house the new moon falls in. We also provide additional information about manifesting and a guided imagery meditation to help set your intentions. Click HERE to register. I LOVE helping people manifest! My greatest accomplishment is seeing people reach their goals. I’m so passionate about it that I wrote a book. 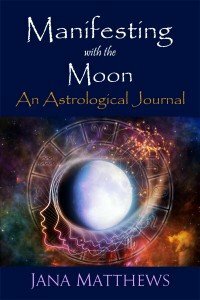 Available through Amazon.com this book provides insight into manifesting, working with the lunar cycles, chakras, and essential oils. As we gain knowledge, we enlighten our minds. We then may have the courage to expand our hearts. As we discover how to manage our emotions and past experiences we feel in control of our lives – living empowered. This journal is intended to provide a place for personal insight into underlying limitations that restrict success. The new moon chapters are to be used as a place for setting goals, while the full moon chapters provide a place to release limiting beliefs and emotions from personal patterns. As we free ourselves from fears and unconscious patterns, we open up to new perspectives and opportunities, helping us manifest what we want.